All laptops today come with hotkeys to adjust panel's brightness. This blog aims to discuss how to control brightness from BIOS's perspectives. ACPI Appendix B.5 (Output Device-specific Methods) defines three control methods for brightness. As in Figure 1, OS queries the list of supported brightness levels from _BCL when it starts (1). This list can be used in UI or by OS kernel when it intends to adjust the brightness. OS also read current brightness from _BQC (2). Together with (1), OS can display how brightness the LCD is in a slider or in a OSD to users. When a user want to adjust the brightness via a slider or hotkeys (more in next blog), OS will call _BCM which calls to EC or to VGA that eventually changes the panel brightness. However, it is worthwhile to note whether to call _BCM is OS- and driver-dependent. At the time of writing, Windows 8 does not call _BCM and Windows 7 may or may not call _BCM depending on VGA, while normal Linux distribution always uses _BCM. A separate blog will discuss how Ubuntu Linux controls brightness. The above is an example of _BCL in ACPI. One of the most common errors is the first two elements are left-out. Meaning OS no longer knows what brightness levels should be used when the AC adapter is plugged and unplugged. The above is a very simple _BCM implementation. It simply passes the brightness level, from OS, to an EC registers (assuming brightness is controlled by EC). Please note Arg0 will be one of the values in _BCL such as 20, 40, 60 and so on in the _BCL example. 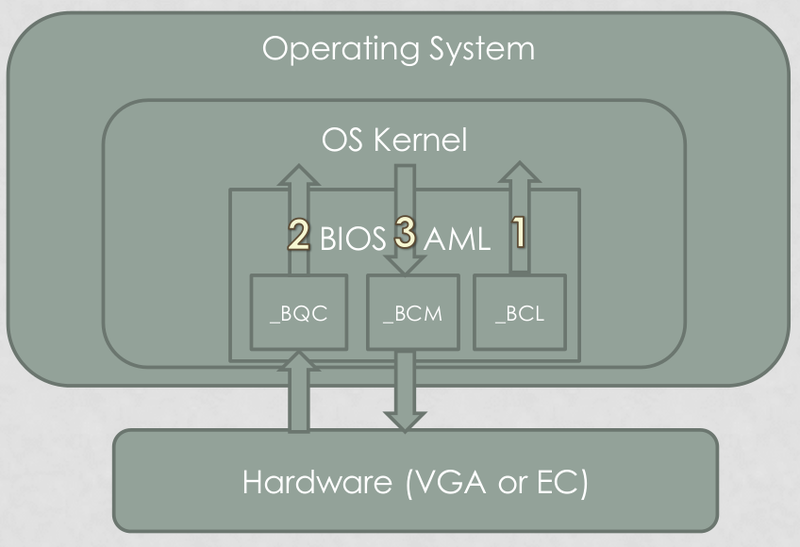 Some Windows VGA drivers do not use _BCM; however, Linux requires _BCM to work correctly. This may or may not be a bug depending on OEMs. The above example simply returns brightness set from _BCM in the above example. _BQC needs to report the value of the brightness, the order of the brightness.